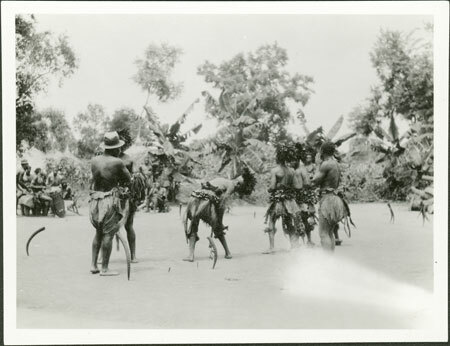 A group of abinza (witchdoctors) dancing at a seance (do avure) with a number of horns thrust into the earth marking out the dance area of each individual. Both wooden gong (gugu) and skin drum (gaza) are being played beyond. This gathering of abinza was held in Evans-Pritchard's own compound on the occasion of the initiation of a new member, Evans-Pritchard's servant Kamanga, and facilitated the gathering of data on the abinza corporation. Morton, Chris. "Zande abinza (witchdoctors) dancing" Southern Sudan Project (in development). 03 Jan. 2006. Pitt Rivers Museum. <http://southernsudan.prm.ox.ac.uk/details/1998.341.116.2/>.